New Trainers - What A Difference New Shoes Make To A Girls Life! It was my birthday recently. Yay, go me! Another year older and wiser *cough*. 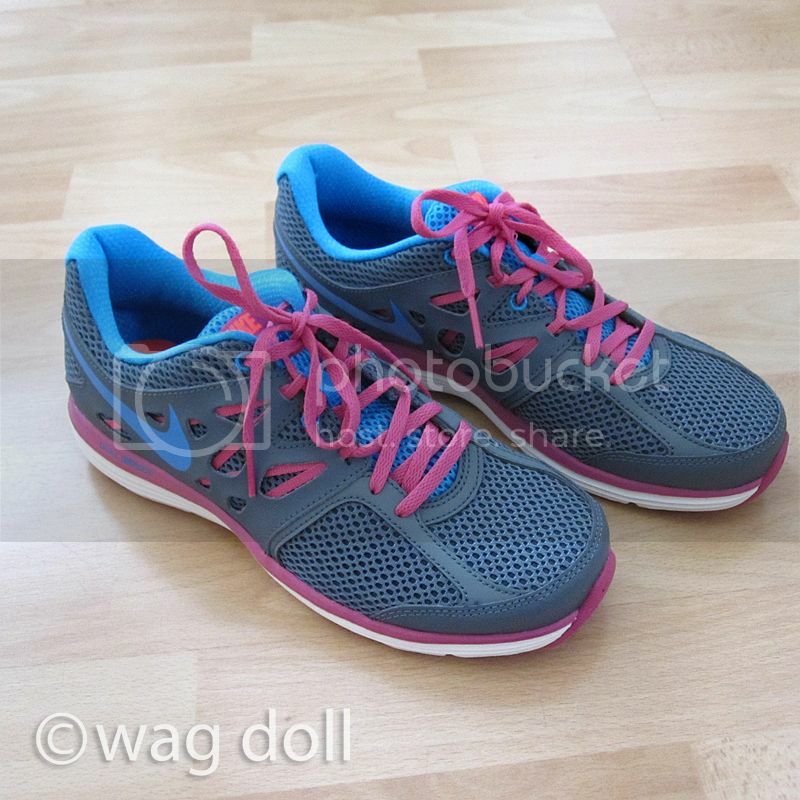 New trainers, thank you Mr Wag Doll! Until I got these I didn't realise how much my old trainers were disrupting my fitness regime. My old trainers were a decent brand, but I've had them for over 4 years and while they fitted me perfectly when I bought them, they were pressing on the ends of my toes recently. Not sure if my feet have changed shape (can they grow as an adult?). Or maybe my old trainers have shrunk somehow, but I'd convinced myself they were the right size and so must fit me. I thought that 'toe nail ache' ...ouch!.....was just a hazard of running. Wrong, your trainers should not cause nail ache, they shouldn't press on the ends of your toes or rub your heels. If they do, you need to be fitted for new ones. I can't believe what a difference my new trainers have made, they're Nike Dual Fusion Lights, whatever that means, I'm not very clued up about brands and the technology of trainers. I just explained to the sales assistant what type of training I do (HIIT and some running) and he suggested these as a good all round cross fit type trainer, excellent for running too. And he was right, seriously they are so comfy, like slippers! So peeps, not that we ever need an excuse for new shoes, but in this instance I actually did need new shoes! These trainers look great!!! It's a perfect gift for birthday!!! These look just the job to get me fit !